--- Playing the chess online, over the board, and reading the books! Let's start this off with a puzzle... what's Black's best move? Maybe you got that easily enough. I didn't. It would have changed the game completely. Ah well. Probably would have gone queen's pawn to d5, threatening to advance the bishop to c5. What did you have in mind? Yes, precisely - it's no mild attack. 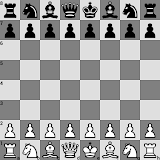 Black's Bishop on c5 would attack White's Queen and King on that diagonal, so probably best for White to move the White King before it gets threatened and sacrifice the White Bishop that's just been attacked by the Black pawn's advance to d5.